Attorney Marty Golando questions expert witness George Korbel during the Mission election trial on Thursday, Oct. 4, 2018, in Edinburg. EDINBURG — Attorneys representing Norberto “Beto” Salinas, the former mayor of Mission, rested their case Thursday following two weeks of testimony in the election trial calling the city’s June runoff into question. Salinas filed a lawsuit against Armando O’Caña, the candidate who defeated him for the mayoral post in the June 9 runoff, which many considered an upset defeat over the longtime mayor, who lost by 157 votes. Since the trial began Sept. 24, Salinas’ lead attorney, his son Ricardo “Rick” Salinas, called nearly two dozen witnesses to the stand to testify that they were either paid to vote or visited by women, alleged to be O’Caña supporters, who encouraged them to vote by mail. Of those who testified to receiving home visits, some said the women filled out their ballots for them while others said they were able to fill them out themselves. In nearly all those cases, however, they testified that the women took the ballot, stamped it and mailed it. Texas law requires that a person who mails a ballot for a voter must sign their name on the carrier envelope; the envelopes of the people who testified during the trial to having their ballots mailed for them did not have such a signature. “I feel very strongly if my 92-year-old mother is voting … her vote should be heard; it should be accounted for,” said Maria C. Tobias, the last witness to take the stand Thursday, upon testifying that a woman from the O’Caña campaign mailed her mother’s ballot, which the county allegedly never received. 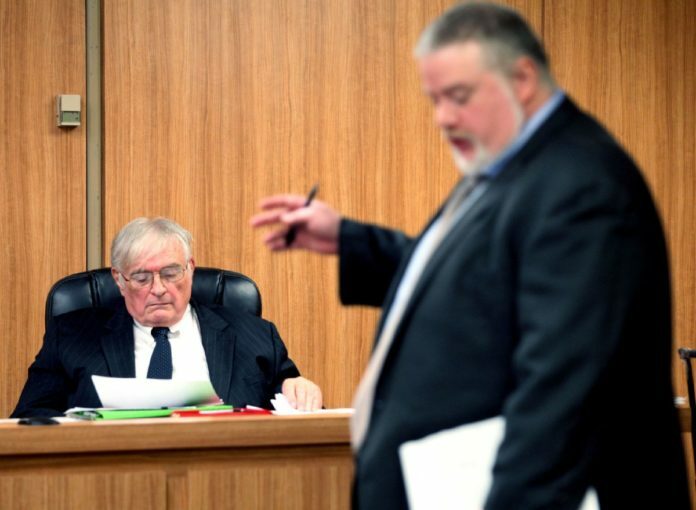 “Sir, I spent two weeks out here (waiting to testify); I hope you take into account every word that was said,” Tobias said to visiting Judge J. Bonner-Dorsey, who was appointed to hear the bench case and will be tasked with deciding whether to rule the results of the June runoff invalid and order a new election. In presenting his case before the judge, Rick Salinas was unable to call two key witnesses to the stand: Veronica O’Caña and Guadalupe “Lupita” O’Caña. Veronica, the current mayor’s niece and campaign manager, and her mother are alleged to have participated in the O’Caña campaign’s scheme to illegally assist voters. Rick Salinas entered into a “gentleman’s agreement” with Gilberto Hinojosa, lead attorney for Mayor O’Caña, that the women would appear in court voluntarily Tuesday if Salinas’ process server did not serve them with a subpoena during the Oct. 1 funeral for O’Caña’s brother. The women, however, failed to appear and his process server has been unable to locate them. Hinojosa told the judge he did not plan on calling any witnesses Friday. If this remains the case, attorneys for both sides will give closing arguments before Bonner-Dorsey issues a ruling, which could come as early as end of day Friday. Rick Salinas has argued, however, that sufficient evidence of fraud is enough to a call for a new election, an interpretation with which Hinojosa disagrees. “There has never been a case in the entire history of the Texas Elections Code of somebody asking the judge that,” Hinojosa said, adding there are only two ways to disqualify the results of an election — if there are enough illegally cast votes that exceed the margin of difference between the winner and the loser, and/or if there is evidence of fraud or mistake on the part of election officials that there are questions as to whether votes were cast illegally. “And (Salinas) didn’t offer any evidence on the second category,” Hinojosa said. Staff writer Berenice Garcia contributed to this report.